“Kyla’s dream was to provide a small gift to the many children who survived, to show that not only were the grown ups capable of helping, but that children were also able to show they cared. The dolls will give the children something to hug and cuddle, providing an emotional bond. These rag dolls are made by children for children, made and given with love. To spread the news around the world please post this website to anyone who could be interested in helping. 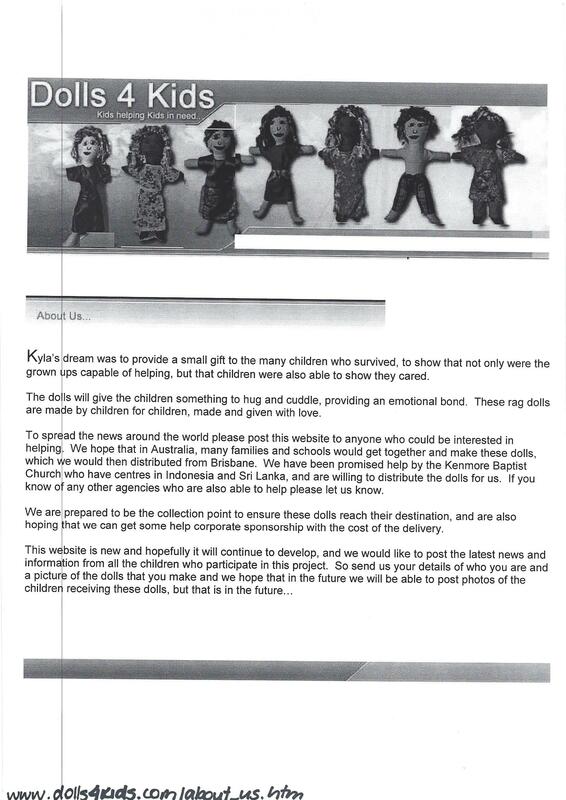 We hope that in Australia, many families and schools would get together and make these dolls, which we would then distributed from Brisbane. 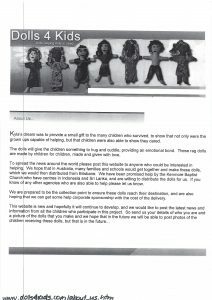 We have been promised help by the Kenmore Baptist Church who have centres in Indonesia and Sri Lanka, and are willing to distribute the dolls for us. If you know of any other agencies who are also able to help please let us know. We are prepared to be the collection point to ensure these dolls reach their destination, and are also hoping that we can get some help corporate sponsorship with the cost of the delivery.